As a fairly new limited company, one thing which occasionally confuses people looking at our documentation and online presence: our full name and designation as a business is BlockSparks OÜ. Why OÜ, as opposed to Ltd or LLC? OÜ is short for OsaühingIt, and signifies the status of a limited company for businesses registered in Estonia. As BlockSparks was coming together as a team earlier this year it quickly became clear that a limited company structure would be the best way to move forward, and indeed it was a non-negotiable requirement for some of the larger organisations we were starting to work with. But then important decisions had to be made, because those organisations, large and small, were distributed all over the world, and used a diverse range of structures and currencies. Where should BlockSparks be? It wasn’t a question with an immediately obvious answer. Of course setting up a UK limited company would have been a much more straightforward option, however sadly my home nation appears hell-bent on political and economic isolationism at present – and although it is much quicker and easier to set up a business there than in Spain, it simply felt like the wrong option, with too many future unknowns just now. We wanted a presence in the Eurozone with the ability to trade worldwide, and a predictable taxation relationship with the countries in which I and my associates reside. Research continued, and before long all answers seemed to point towards a small Northern European country I had never visited: Estonia. 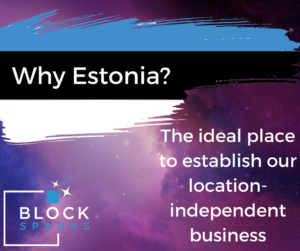 With a thriving tech start-up scene and a government committed to eliminating bureaucracy and red tape, Estonia turned out to be the perfect place in which to establish a location-independent business. 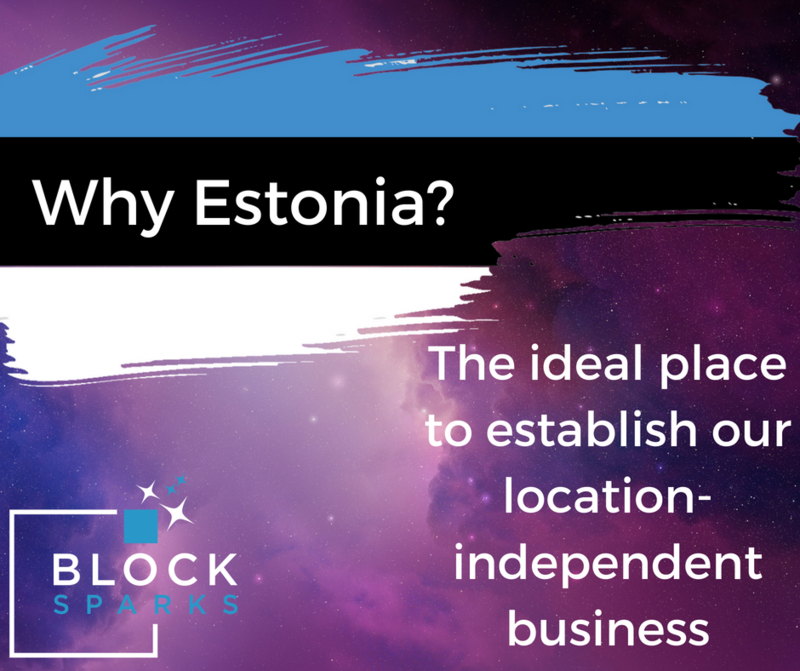 Despite having a population of fewer than 1.5 million people, Estonia is the world leader in digital governance, and a founding member of Digital 5 (D5), a global network of leading digital governments, and welcome entrepreneurs from around the world to set up there. 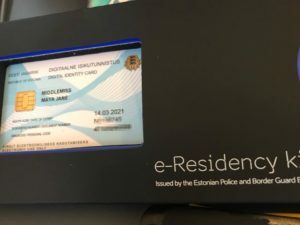 The first thing I needed to do was become an e-Resident of Estonia. This did not require a visit, and the application was completed online, I believe it cost around €100. It was necessary to state a genuine reason for applying, and acceptance is at the discretion of the Estonian border police, but general enthusiasm for the e-Residency programme appears to be sufficient qualification subject to background check – within a month I was invited to attend the Estonian embassy in Madrid (a tiny, friendly office), to collect my digital ID. Now at this point I could have proceeded to set up everything completely independently, however I chose to use the turnkey business support service LeapIn, to set up and operate BlockSparks. They provide a portal accessed by your digital ID on a platform-as-a-service basis, which enables you to operate the business, sign contracts digitally, encrypt and send documents securely, make transactions and declare Estonian taxes – all entirely online and paper-free. Establishing the business took literally less than one day (apparently their record to beat is 18 minutes! ), with this completely transparent digital process all supported in impeccable English too. It costs me around €70 per month for the platform, which is far less than I would have to pay an accountant in Spain to administer a limited company, and provides far more – they basically do all of my accounting admin: I can raise invoices easily within the portal, and simply upload receipts for outgoings (which do not, unlike in Spain, have to be a formal factura written in blood with full tax references, and where out-of-pocket costs are almost impossible to account for). I similarly upload bank statements at regular intervals, and the kind and helpful people at LeapIN do the rest. They even cope with the fact that some of our clients prefer to settle their invoices in cryptocurrency, and have helped me establish a suitable payment gateway to account for this. I also have access to a fair and simple tax system (with all the paperwork done for me), and a presence in the EU single market. Once I have the correct bank account sorted, everything in the portal should be reconciled pretty much in real-time – for now as a very new and totally bootstrapped startup, I do maintain a backup ledger in a Google sheet, just to keep in top of income and outgoings from a cash point of view, however I can see that in future I won’t need this stage. So the final step is for me to finally travel to Tallinn this summer and open a proper business bank account with their national bank, a process still requiring face-to-face KYC, ironically enough in this paperless and digital-first world. However I am looking forward to saying hi to the LeapIN crew in person and seeing the country of which I am an e-resident for the first time. And although e-residency does not confer any kind of citizenship, travel privilege, tax residency or right of entry to the EU or Estonia, for a Brit about to have my EU citizenship summarily taken from me it’s a comfort of sorts to have this status. And apparently my fellow Estonian e-Residents include Japanese Prime Minister Shinzō Abe, former Apple evangelist Guy Kawasaki, and Timothy Draper from the venture capital firm Draper Fisher Jurvetson, amongst over 41,000 others. Compared with operating a Spanish limited company, it feels a lot like the difference between an old-fashioned branch-based clearing bank, with all the hassle and expense and paperwork, compared with a service like Revolut or N26 (but the LHV business bank account is fully secured with a state-backed bank deposit guarantee). That’s a win-win in my paperless book. So, ¡tere tulemast! as we say in Estonia. Everything’s looking bright. Just to close the loop, a quick trip to Tallinn in August sealed the deal on the business bank account. How funny, in these days of crypto, that they still have to look you in the eye for this, at least at LHV! But my only regret is that I didn’t get to spend a bit longer in this fascinating country – I will definitely go back sometime, the wonderful mixture of super high tech with medieval architecture made for a very interesting mix indeed.